Alethea was born at Loscoe Nook in the mid 1920s. When she was only aged six, her father George Belshaw was killed at Loscoe Pit. He left a widow, Alethea’s mother Maud and three children, one older and one younger than Alethea. Times were very hard for the family, Maud had to work full time cleaning and doing other people’s washing to feed her children and keep the home together. Alethea says sometimes when her mother finally got home from work, she was too tired to eat. When Alethea first married she went to live for a while at Stoneyford, a tiny isolated hamlet, reached over the fields from Codnor Park. There were no pathways and you couldn’t keep a pair of shoes clean, due to the mud. Her husband Joseph Hayden Flint worshipped at the tin tabernacle there. When Alethea and Hayden moved to Albert Avenue, Jacksdale, Stoneyford CC were sorry to lose Hayden as he was a good cricketer but their loss was Jacksdale CC’s gain! A lovely story, with a varied cast of local characters, with mentions of Sammy Traunter, Bill Parr, Mr Major, shopkeeper and Mrs Saint. Photo Above: George Belshaw taken from the newspaper article dated 12th Feb 1930 in the Derbyshire Daily Telegraph, reporting on his tragic demise at Loscoe pit. 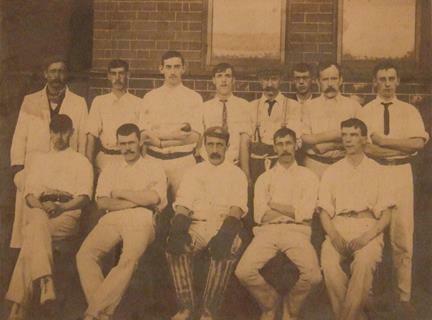 Photo: Stoneyford CC 1906/ 1907 Winners of the Derbyshire Junior Alliance. ( a bit before Alethea and Hayden’s time, however the gent sitting front row, far left is Henry Flint, Alethea’s father-in-law.) Names are: – Left to right. Back row – Arthur Darrington ( umpire) , Ben Crich, John Hubball, Charlie Longdon, William Darrington, Sam Heath (scorer), Herbert Longdon, Alan Grainger. Front row – Henry Flint, Jack Heath, George Darrington, William Longdon, Ernest Tatlow.